As Oregon’s 2013 football season came to a close, the majority opinion was, “the sooner the better.” It’s a testament to how high the bar has been raised at Oregon that another double-digit win season, capped with a bowl victory, was cause for disappointment. However, amid the gloom, hope for next season came when quarterback Marcus Mariota and his teammates, center Hronis Grassu and All-Everything cornerback Ifo Ekpre-Olomu, declared that they would all be returning to Oregon next season. This was great news, and a bit of a surprise, as all three could have left for the NFL, and many pundits had them inked in as gone. What wasn’t a surprise, though, was that the five-star embodiment of the “blur” and the recruiting symbol of Oregon’s ascension to elite status, the Black Momba — De’Anthony Thomas — wouldn’t be coming back. With DAT injured, Byron Marshall seized the role of every-down back and ran for more than 1,000 yards. His first two seasons at Oregon were nothing short of spectacular, elevating him to the status of “SportsCenter” regular. But the 2013 season was a different story. The relationship he and Chip Kelly had forged produced greatness for Thomas, as he befuddled opposing defenses — in large part because they never knew where or when he would show up. But this past year, things were different. It wasn’t that first-year head coach Mark Helfrich took the biggest play maker Oregon football had seen in years out of the picture because he thought it would be better for Oregon. It was more a matter that the personnel on offense had changed in a major way. Rather than being the wildcard that Kelly played so effectively when LaMichael James and Kenjon Barner were available, Thomas, all 5-foot-8 and 170 pounds of him, took his shot at being the featured every-down back. 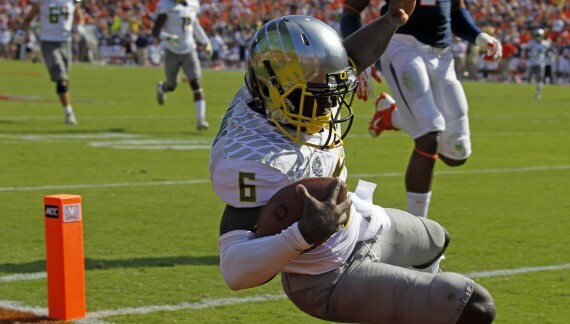 Changes in player personnel affecting star status has happened before at Oregon. Back in 2007 the basketball team had a supercharged weapon that their foes didn’t know how to deal with in Tajuan Porter. Free from the duties of being the point guard, Porter dashed around the court, firing up 3’s with abandon. But when Aaron Brooks and Bryce Taylor left, Porter took over the point, with the unfortunate result that his, and the team’s, performance plummeted. 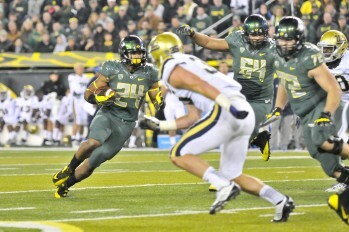 Thomas Tyner blazed to a 10.3 100 meters as a sophomore in high school. 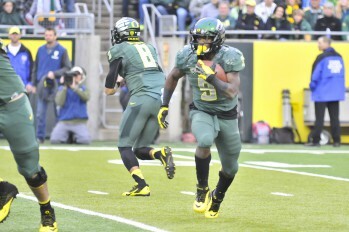 Fortunately, Oregon’s football team didn’t follow suit and fall apart offensively with the change in Thomas’s role. With Marcus Mariota being a gifted runner, the read option frequently called for him to hang onto the ball and go, with great success. Also, the passing game was emphasized much more than it had been the previous two seasons, with Bralon Addison, Josh Huff and Keanon Lowe all making big plays game after game. So when Thomas injured himself returning the opening kickoff in the Cal game, the offense didn’t collapse. Instead, it was the formal beginning of DAT’s replacement by committee. The team kept going and stayed undefeated during his recovery. It was when he returned for the game against Stanford, with Mariota playing injured, that the Ducks lost, and for the remainder of the season, the once irreplaceable DAT had a hard time getting back into the flow. 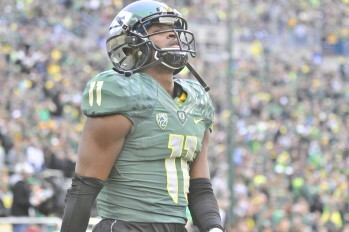 Already lighting up the scoreboard on returns, look for Bralon Addison to be the “go-to” receiver. When Helfrich took over a lot of people wondered what changes he’d make at Oregon. In the case of how Thomas was used, Helfrich appraised the situation he had, and dealt with it in a way that not only kept the offense humming, but also gave players experience that will help the team next season. Huff will be gone, but Addison and Lowe both return. (And speaking of “returns,” Addison did a decent job of filling that role as well.) Thomas Tyner and Byron Marshall both gained valuable experience and will be that much better, allowing prized running back recruit Royce Freeman time to get his feet under him. If Thomas had stayed at Oregon, he would not have regained the position of featured back. He could have been used as a slot receiver — a hot position in the NFL right now — and one that would have fit right in with Oregon’s now-potent aerial attack. But DAT decided to move on, and so will Oregon football.